Simple Raid Planner mainly designed for MMORPG. MushRaider is a FREE Raid Planner, designed for MMORPG, intended to be simple, fast and clean. 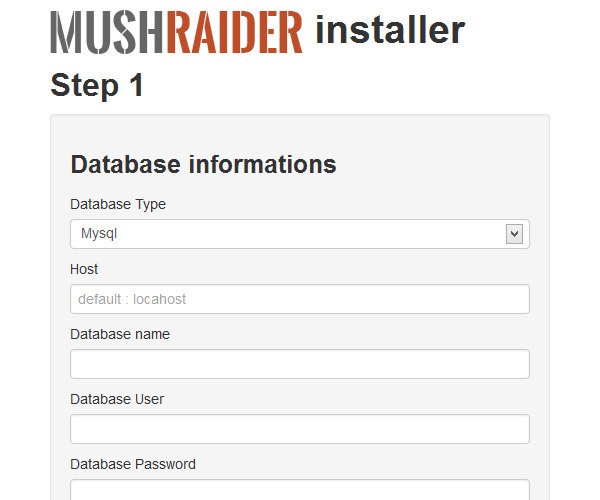 MushRaider use PHP5, MySQL, HTML5, CSS3 and is powered by CakePHP and Bootstrap frameworks. 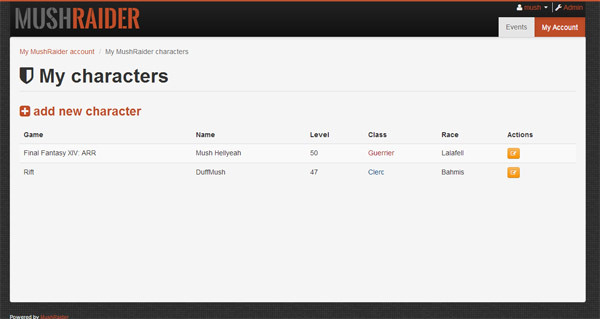 If you have a guild and want to manage your roster, events, games... MushRaider is the perfect tool ! MushRaider is distributed in English (default) and French. Your players have rerolls ? No problem, each player can have has many characters on has many games as he want and choose a different character for every event to play with. MushRaider is fully customisable and support easy theming right into the admin panel ! 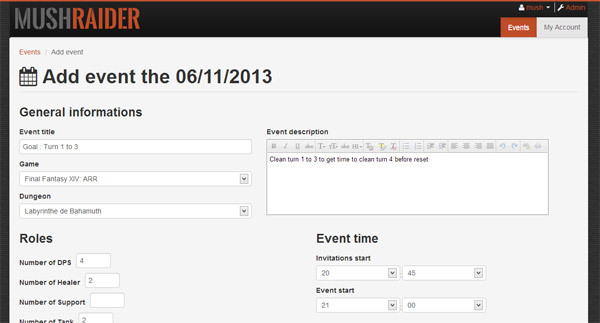 You can add a comment specific to your event's apply and/or discuss with other players for each event. Notifications can be enable in admin panel to automatically send email when new event is created, user is validated to an event or event is cancelled. You can test the MushRaider demo here and create an account to test it as a user point of view (note that accounts are automatically validated for the demo purpose). Note : the demo is reset every 24h. Where is the error log ? How can I display PHP errors ? Tactile theme by Jason Long modified.